Products that cause injury due to bad workmanship or materials can be addressed with this purchase complaint letter. 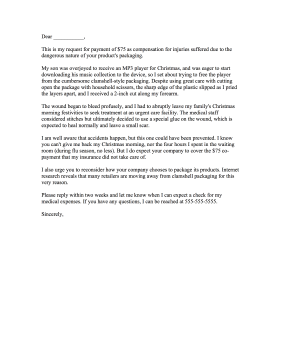 This is my request for payment of $75 as compensation for injuries suffered due to the dangerous nature of your product's packaging. My son was overjoyed to receive an MP3 player for Christmas, and was eager to start downloading his music collection to the device, so I set about trying to free the player from the cumbersome clamshell-style packaging. Despite using great care with cutting open the package with household scissors, the sharp edge of the plastic slipped as I pried the layers apart, and I received a 2-inch cut along my forearm. The wound began to bleed profusely, and I had to abruptly leave my family's Christmas morning festivities to seek treatment at an urgent care facility. The medical staff considered stitches but ultimately decided to use a special glue on the wound, which is expected to heal normally and leave a small scar. I am well aware that accidents happen, but this one could have been prevented. I know you can't give me back my Christmas morning, nor the four hours I spent in the waiting room (during flu season, no less). But I do expect your company to cover the $75 co-payment that my insurance did not take care of. I also urge you to reconsider how your company chooses to package its products. Internet research reveals that many retailers are moving away from clamshell packaging for this very reason. Please reply within two weeks and let me know when I can expect a check for my medical expenses. If you have any questions, I can be reached at 555-555-5555.